More than seventy cases were indicted by a grand jury overall. 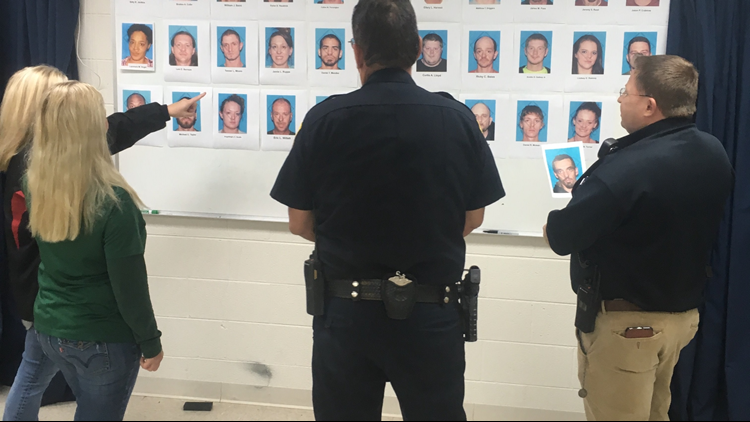 Rockwood Police and several other agencies conducted a round-up Thursday to arrest 34 people on drug offenses involving opioids and other pills, methamphetamine and heroin, and some heroin laced with fentanyl. Officers, agents, deputies and prosecutors with the Rockwood Police Department, the 9th District Drug Task Force, the Tennessee Bureau of Investigation (Drug Enforcement Division), the National Guard Drug Task Force, the US Postal Service, the Roane County Sheriff’s Office and the 9th District Attorney General’s Office met at a briefing at the DA’s office at 6 a.m. before heading out at 6:20 a.m. to conduct the arrests. The grand jury indicted more than seventy cases overall. According to 9th District Attorney General Russell Johnson, a large number of those were drug cases stemming from Chief Bill Stinnett's Rockwood Police Department year-log operation headed up by narcotics investigator Josh Rymer. He worked with confidential sources and drug informants to target individuals who were known traffickers in illegal narcotics and prescription pill distribution. A large number of the cases involve methamphetamine, the district attorney general's release stated. "The trend for methamphetamine in cases like those indicted Monday is now, with the implementation of laws restricting cold medication purchases, usually crystal meth or ice that originates out of Mexico or other parts of the US where the Mexican drug cartels are the main suppliers into our region, especially coming out of the north Georgia region around Dalton," the release said. The DAG's office said in the early 2000s, the trend for methamphetamine was homemade in rural one shop labs or later by an even simpler shake & bake method - both which required large amounts of ephedrine. "Also, as a rule of thumb, most of the heroin travels down from the north out of the Detroit and Chicago area and makes its way to Rockwood from Knoxville or Oak Ridge," Johnson said in the release. The law enforcement officers involved with Thursday's round-up and arrest of defendants includes seven females and 26 males. Of the 33 targeted individuals, at least eleven are already in custody – most in the Roane County jail – and one female is actually already in federal custody, the DA's office said. The first targeted person was already arrested before 7 a.m., according to the DA's office. They are all being brought back to the DA’s office for processing before being taken to the Roane County Jail. "The reason for the ‘off sight’ processing and pre-booking is to not overwhelm the jail all at once, which is already overcrowded with inmates," the release said.